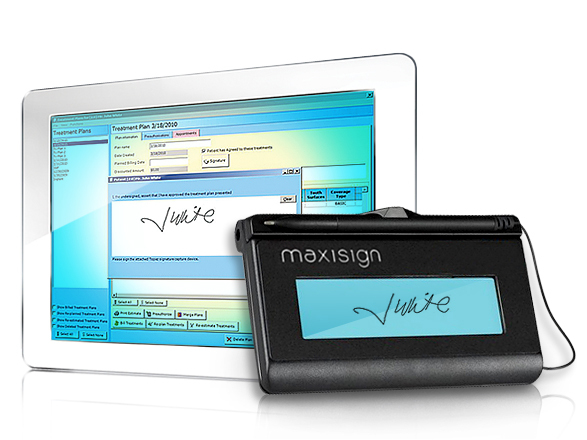 MaxiSign™ Electronic Signature Capture Device is a tool that you can use to authenticate specific entries in the database capturing signatures of patients or hygienists. Using this device to capture the patient’s signature authenticates the accuracy of the data and electronically “stamps” the entry in your database. The equivalent authenticity occurs as above when the patient approves a treatment plan. You store the signature electronically. When issuing a prescription for your patient, the hygienist signs the prescription that prints from MaxiDent 6. This e-signature authenticity is another level of protection for your patients, practice and neighborhood pharmacies. This protects the clinic’s records if the regular hygienist is not present. It is especially important if there is a contract hygienist, associate, or locum.